All done in Albuquerque — another great 24 Hours Comic Day in New Mexico has successfully concluded. Thanks to the 7000 BC members who worked so hard to put this all together; Media Arts Collaborative Charter School for hosting; Winning Coffee Company and Downtown Java Joe’s for their food donations; Astro-Zombies, Comic Warehouse, and the new Kaboom Test Labs for their prize donations. And, of course, to all the participants who made this such an amazing time. HOUR NINE: Some Words of Thanks! HOUR ELEVEN: Still More Raffle Winners! HOUR TWELVE: We’re Halfway There! HOUR THIRTEEN: And They Say the Arts are Dying in America? HOUR TWENTY-ONE and TWO: The Final Raffle! 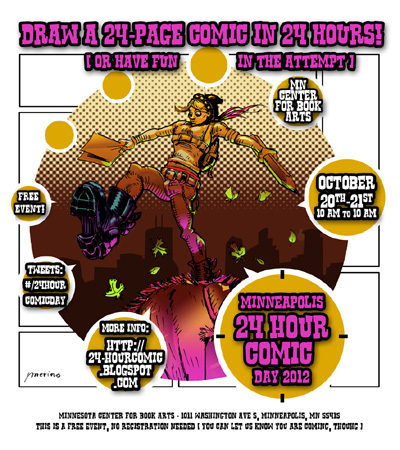 24 Hour Comics Day is this weekend! I hope you’re already asleep in preparation! Want to participate? Just show up. Table space is available on a first come, first served basis. Please consider bringing some snacks to share and help fuel us into the night. Late night pizza will be sponsored by our friends at the Midwest Comic Book Association and The Source! Wet Paint will be there to help supply you with needed art supplies early in the event! 24 Hour Comics Day is This Weekend! Come to the Minneapolis Event! Accept the challenge — be a part of 24 Hour Comics Day 2011. Join 7000 BC and make a 24-page comic book pages in 24 consecutive hours. No experience or special skills needed — this free creative exercise is open to everyone. Test your stamina and learn you what you’re capable of, along with thousands of artists of all skill levels from around the globe. Albuquerque has consistently been one of the largest gatherings in the world for this international event. See photos from past years here and here. This year’s location is Media Arts Collaborative Charter School (MACCS) in Albuquerque, at 4401 Central Ave. N.E. If you plan on participating, please send an email so we can get a count of participants. This event is open to all ages (with guardian’s permission for minors). 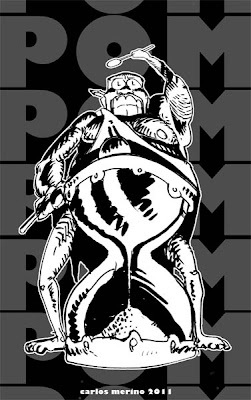 Bring your papers and pens and join us at New Mexico’s only 24 Hour Comics Day location in 2011! and to ComicsPro for puttting it all together.